WASHINGTON, DC, February 22, 2015 (ENS) – The Hindu American Foundation, in partnership with the Bhumi Project, based at Oxford University, is hosting Hindu Environment Week, an international event to honor Matru Bhumi or Mother Earth. 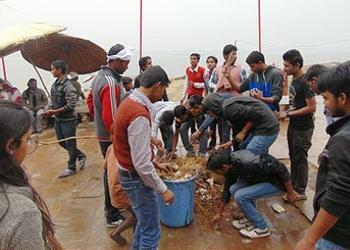 The Bhumi Project is an international Hindu response to the environmental challenges facing the planet. It is facilitated by the UK’s Oxford Centre for Hindu Studies in partnership with the Alliance of Religions and Conservation, a secular body that helps the world’s major faiths develop environmental programs based on their own core teachings, beliefs and practices. “The purpose of Hindu Environment Week is to increase the global Hindu community’s engagement with critical environmental issues. The aim is to have Hindus volunteer at events where they can discuss climate change, hike in a national park, or clean up their local temple grounds,” said SriVani Ganti, director of member and chapter relations at the Hindu American Foundation, based in Washington, DC. “Hindu scriptures focus a great deal on Mother Nature, or Matru Bhumi and how we should honor her for all the resources she provides us, so environmental activism is a natural fit,” said Ganti. “Our hope as Hindu Americans is to find solutions within our ancient teachings to address the most pressing environmental issues of our time and proactively incorporate these teachings – teachings such as seeing nature as a manifestation of the divine, living in moderation and in a non-harming way – into our daily lives,” she said. But Ganti acknowledged that since this is the first year programs have happened across the country, it’s difficult to gauge the level of impact Hindu Environment Week will have in the United States or within the Hindu American community. The week kicked off Tuesday in Houston where the Hindu American Foundation’s local chapter handed out reusable grocery bags during the Durga Bari Society’s Maha Shivaratri worship. On Saturday three other events were held in Oakland, California; Tampa. Florida; and Ann Arbor, Michigan. As part of the observance, volunteers helped to restore the Oakland Zoo, which is in shambles due to U.S. budgetary cuts. The Hindu American Foundation’s Northern California chapter joined dozens of other volunteers to restore the zoo by refurbishing its gardens and exhibits. In Tampa, Hindu American Foundation volunteers cleaned the local temple premises, while in Ann Arbor, members of the foundation and the South Asian Awareness Network screened “The Story of Stuff” and learned how consumerism is negatively affecting the environment. The Bhumi Project and the Hindu American Foundation have been working together for several years. One such endeavor was the Bhumi Pledge, which aims to create a worldwide movement of young Hindus who are committed to caring for the environment. According to Ganti, the Bhumi Project spearheaded Hindu Environment Week by reaching out to Hindu-based organizations globally. 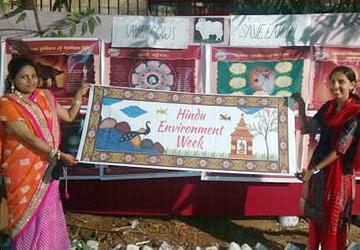 Hindu Environment Week aims to engage university students, and many other members of the community are also participating. 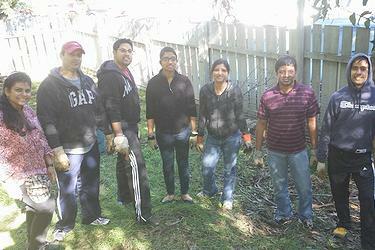 “No matter the participant’s station in life, Hindu Environment Week encourages them to put into practice the ancient Hindu teachings about respecting and protecting nature with simple lifestyle choices including Meatless Mondays, walking or biking to class instead of taking public transport, or cleaning local parks,” Ganti said. Ganti explained that Hindu Environment Week was first celebrated in 2014 with over 5,500 people participating, primarily at Hindu holy sites in India. In 2015, Hindu Environment Week has become a larger global effort with events in India, the United Kingdom and the United States.